Final Fantasy XV has got a lot of expectations to live up to. It's been floating around for almost 10 years, beginning as Final Fantasy Versus XIII and resurfacing at E3 a few years ago as Final Fantasy XV. For almost 10 years, myself and others have been waiting to find out when it'll be out, what it'll be and will it be better than more recent Final Fantasy games that a lot of fans didn't enjoy so much. Despite this, I walked into Platinum Demo: Final Fantasy XV with leftover hype and positive expectations for the game following the Final Fantasy XV Uncovered event. The demo is only 20-30 minutes long, but it's a good teaser for the full game, showcasing some of what's to be expected from the game's combat, boss battles and interactive worlds. Platinum Demo is a standalone story that won't be featured in Final Fantasy XV. It looks into a dream from Noctis' childhood where small Noctis is led through the game by Carbuncle, an adorable rabbit like creature that's featured in other Final Fantasy games. 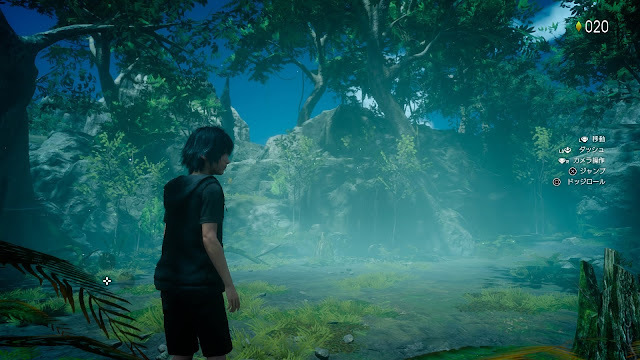 The goal of the demo is to get Noctis to awaken from the deep sleep he's in, so he must explore and survive this dream world in order to wake up. While there isn't any significant detail given to Noctis' character, the dream world is so incredibly stunning and the experience of just playing the game is good enough that it isn't really needed. From the start menu to the landscapes, every character, every area and every gem is stunning in Platinum Demo. Maybe it's because I've been playing a PS2 classic recently, but I swear it's the most stunning game I've seen on my HD monitor. It's beauty makes exploring the world enjoyable from the get-go and each time a new area was unveiled, I wanted to explore all of it just to see how pretty everything was. Collecting gems from around the area have the ability to unlock coloured plates scattered around the world. These plates can do things such as change the weather or time of day, give gifts or change Noctis into something new. Because of how beautiful everything was, even being able to see the landscape go from Day to Night or from Sunny to Rainy was a little exciting, especially knowing the final game will feature these things in even bigger open world environments. Aside from exploring the world, one of the most exciting things about Platinum Demo is finally being able to see the combat. 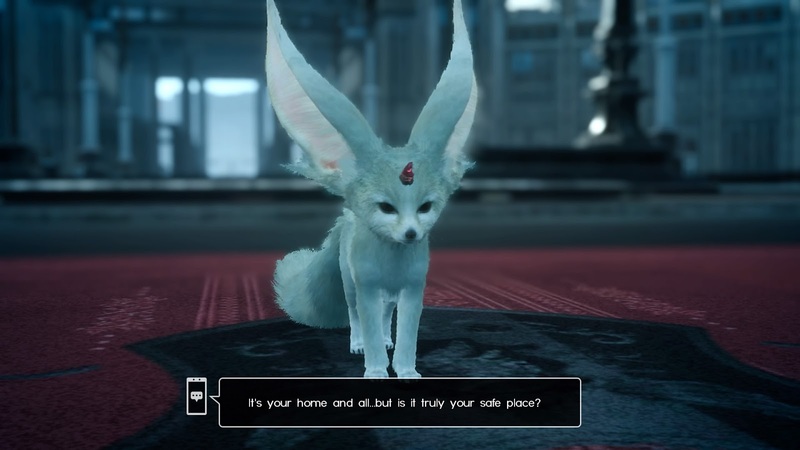 Since I didn't play the Episode Duscue demo, I was most keen to see what kind of creatures and battle system would be used in Final Fantasy XV. Without separate screens for battles, battles are now completely active, which isn't a surprise considering more recent Final Fantasy games have been adopting versions of this style. Much like in Final Fantasy XIV or Kingdom Hearts, when you get close enough to an enemy, battle begins and enemies will begin to attack you. In this demo, you have the choice of a sword or a hammer as your main battle weapons, along with some magic items you can find as presents. Thanks to the active element of the battle, a little more skill is required now with locking onto enemies and aiming spells accurately as an important part of battle. Since these controlled similarly to Kingdom Hearts, I was able to pick this up quick enough thankfully, but this may be a surprise to some players. Another thing I really liked was the way it incorporated timed-battle buttons during the boss battle. At one point the boss was about to hit me, but I had the option of parrying his hit and making a counter attack if my thumbs were quick enough (they weren't). This reminded me of Final Fantasy XIII-2's version of this, but much better as it was apart of battle and could be used as a way to get an edge on an enemy for particularly sharp players. Even though I'm usually a fan of turn-based battle systems, I felt like Platinum Demo's combat was a breath of fresh air from previous games thanks to the way it required more skill and thinking on my feet. I mentioned a little the Kingdom Hearts feel of the combat, but there are shades of Kingdom Hearts throughout Platinum Demo in more ways then one, perhaps due to how young Noctis is in this game. 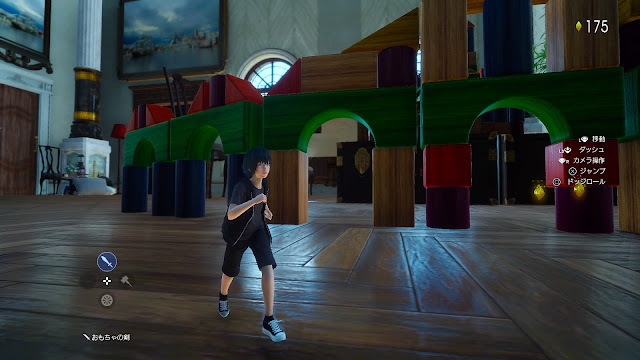 The second area available to explore has Noctis as a shrunk down version of himself, very reminiscent of the Alice in Wonderland world of Kingdom Hearts, the music is done by the composer who also composed for Kingdom Hearts and even the way Noctis wields a sword reminded me a bit of Sora from Kingdom Hearts with his keyblade. This isn't necessarily a bad thing, but it was a little surprising. I didn't mind it in some senses as it made the battle system feel more familiar, but I do hope that when Final Fantasy XV is released, Noctis being an adult feels like a more original character. 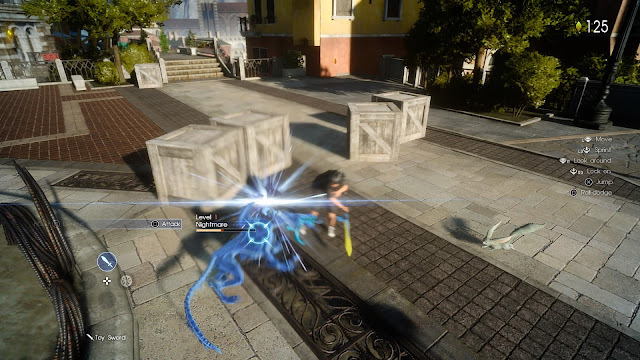 Like a good bite-sized experience, Platinum Demo: Final Fantasy XV left me wanting more with it's brief teasers of what will be seen in the full game of Final Fantasy XV. While it doesn't feature a deep story or a lot to do, just seeing the stunning visuals, fighting enemies big and small and collecting gems was a nice introduction to what the game will feature. Whether or not the actual game lives up to the positive impression left from this demo and Final Fantasy XV Uncovered, I can say this demo has me excited and intrigued about what's to come, with plenty revealed in the demo but with plenty of mysteries still in tact. Finding different things on my three playthroughs was really fun and was a good teaser for what's to come and everything about it was stunningly beautiful! You can pre-order Final Fantasy XV from Play-Asia.com now! What did you think of Platinum Demo: Final Fantasy XV? What did you name your Carbuncle? Leave a comment below or send me a tweet at @JRPGJungle and let's talk!